A RCMP Mountie clad in his traditional red uniform atop a horse is part of the Klondike Gold Rush National Historic Site in the Yukon and there is not many places left where you can view a Mountie dressed in his true Canadian uniform. The Klondike Gold Rush National Historic Site in Dawson City takes you back in time to the year of 1896 when Dawson City became the center of the gold fields. 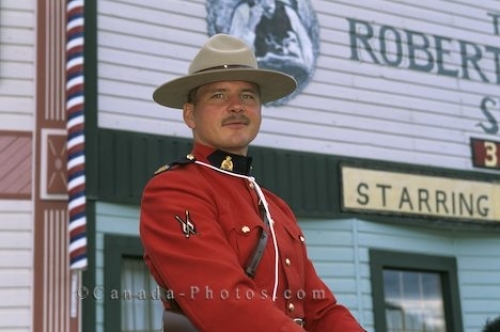 Picture of a Canadian Mountie in his uniform at the Klondike Gold Rush National Historic Site in Dawson City in the Yukon.